Switzerland's Stan Wawrinka celebrates winning in the quarterfinal match of the French Open tennis tournament against Switzerland's Roger Federer in three sets 6-4, 6-3, 7-6 (7-4), at the Roland Garros stadium, in Paris, France, Tuesday, June 2, 2015. Stumbling on his way to the net, Roger Federer dropped his racket and fell to his knees on the red clay. Hardly the sort of grace and precision the world has come to expect from the 17-time Grand Slam champion. There were other unusual sights in Federer's 6-4, 6-3, 7-6 (4) loss in the French Open quarterfinals Tuesday against his pal and Swiss Davis Cup teammate Stan Wawrinka. "I made 30-something errors today. He, maybe, made one," said Federer, exaggerating a bit. Rarely injured and appearing in a 62nd consecutive major, Federer received treatment on his right hand from a trainer during a second-set tiebreaker. For years and years a dominant and confident force in tennis, Federer slumped in his changeover chair, head bowed, after falling behind two sets to none. And, according to the ATP, this was the first time since a fourth-round loss at the 2002 U.S. Open — back before he'd won a major trophy — that Federer failed to break an opponent's serve once in a Grand Slam match. "I know that when I play good tennis, when I play my best tennis, I can play so heavy from both sides that it's really tough for the opponent to play," said the eighth-seeded Wawrinka, who will play 14th-seeded Jo-Wilfried Tsonga of France in the semifinals Friday. "That's why Roger was struggling today. It's because I was playing so well." So long superior to the younger Wawrinka, Federer was defeated for only the third time in their 19 head-to-head matches, and for the first time in five meetings at Grand Slam tournaments. "I tried many things," Federer said. "Obviously I was not going to leave the French Open without having tried everything out there." During the eight French Opens from 2005 to 2012, Federer reached at least the semifinals seven times, including winning the 2009 championship to complete a career Grand Slam. But this is the third year in a row he exits Roland Garros in the quarterfinals or earlier. Give Wawrinka credit. Powering the ball from the baseline in Court Suzanne Lenglen on a windy day, he produced groundstrokes that cut through gusts topping 30 mph (50 kph). "I'm a little bit surprised to win that match in three sets and the way I did," Wawrinka said, "but it's a great feeling." Over at Court Philippe Chatrier, Tsonga's 6-1, 6-4, 4-6, 3-6, 6-3 victory over No. 5 Kei Nishikori was interrupted for about 40 minutes when one person was injured after a 9-foot-long (3-meter-long) piece of metal paneling was blown off a giant TV screen and fell onto packed rows of spectators below. French Open organizers originally said three people were hurt, but tournament director Gilbert Ysern later said two were fine after being checked at an infirmary. One went to the hospital for an injured wrist. When he finally defeated Nishikori, who was trying to become the first Japanese man to reach the French semifinals in 82 years, Tsonga knelt on the court, then rose and used the sole of his right shoe to write "Roland, je t'aime" — "I love you, Roland" — in the clay. Tsonga then got down on his back, with arms and legs spread apart, as 15,000 or so of his closest friends stood and roared their approval for their man's second trip to the Roland Garros semifinals. "You supported me," Tsonga told the crowd. "I will never forget it." He's a burly guy who can rip the ball as hard as just about anyone on tour, and he and Wawrinka have evenly split six career meetings. As well as Wawrinka played Tuesday, he probably would have been just fine without the point conceded by Federer after a disputed call in the tiebreaker. 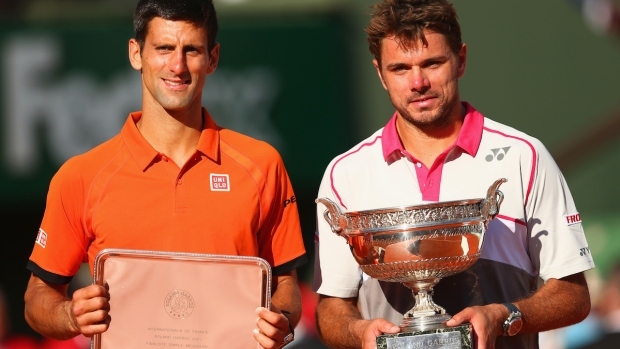 "I played my best match in a Grand Slam tournament," said Wawrinka, quite a statement considering he won the 2014 Australian Open, "and my best match on clay." The other men's quarterfinals are Wednesday: No. 1 Novak Djokovic against nine-time champion Rafael Nadal, and No. 3 Andy Murray against No. 7 David Ferrer. One women's semifinal was set Tuesday: No. 7 Ana Ivanovic against No. 13 Lucie Safarova. Safarova, who eliminated defending champion Maria Sharapova in the fourth round, beat Garbine Muguruza 7-6 (3), 6-3 to reach the second major semifinal of her career. Ivanovic reached her first Grand Slam semifinal since winning the 2008 French Open by defeating Elina Svitolina of Ukraine 6-3, 6-2. "I don't know if I should feel very old," said Ivanovic, 27, "or very happy."